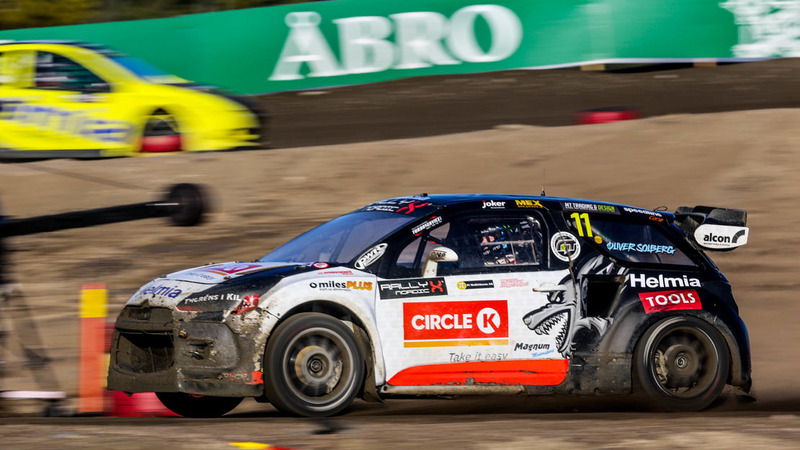 Oliver Solberg is coming under pressure in the fight for the RallyX Nordic presented by Cooper Tires series after a dramatic three qualifying races at the Tierp Arena saw Oliver Eriksson and Thomas Bryntesson close the gap on the leader. Though all three drivers picked up a win each in the qualifying races, Solberg suffered a puncture in Q2 to leave him eighth on the timesheets before a suspension break in Q3 left him down in 10th place. Even so, Eriksson – second in Q1 and winner of Q2 – couldn’t fully capitalise, after contact with Lukas Walfridson at the start of race three broke the rear suspension on his Ford Fiesta and forced him into a DNF. Opening the door for Bryntesson to win the final race, it meant the JC Raceteknik driver came away with maximum points in the Intermediate Classification. Nonetheless, Eriksson’s accumulated points were still enough to place him second, unlike Solberg who could only end the session in fifth position. It means coming into the semi-finals and final – with a maximum of 14 points up for grabs – Solberg still leads but by just three points from Eriksson, while Bryntesson is now just eight points behind the top spot himself. Larsson and Walfridson pick up third and fourth ahead of Solberg, while Ulrik Linnemann fails to finish Q3 to drop him to 11th in the intermediate classification. Championship leader Sami-Matti Trogen clinched the Intermediate Classification honours in the RX Academy to put him further on course for title glory. Viktor Andersson, meanwhile, eases to mid-way glory in the SRX class with a trio of qualifying race successes.